It’s all good! Don’t ask questions just go eat. It’s sad when you call to make a pick up order and the girl answering the phone sighs loudly like you just ruined her night, then says in a tone like she really don’t wanna be bothered “we got like a 25 minute wait”. I won’t ever eat there again! best wings in town! 5 stars! Food truck staff is awesome and the food is the best! My daughter is a student at USA and she always at this place so when I came to visit her, guess where we went? Yessss I can see why she eats here everyday. The food is awesome! I had never been there before but I will definitely be back. It was delicious! The husband and I enjoy their wings. We order from them all the time. 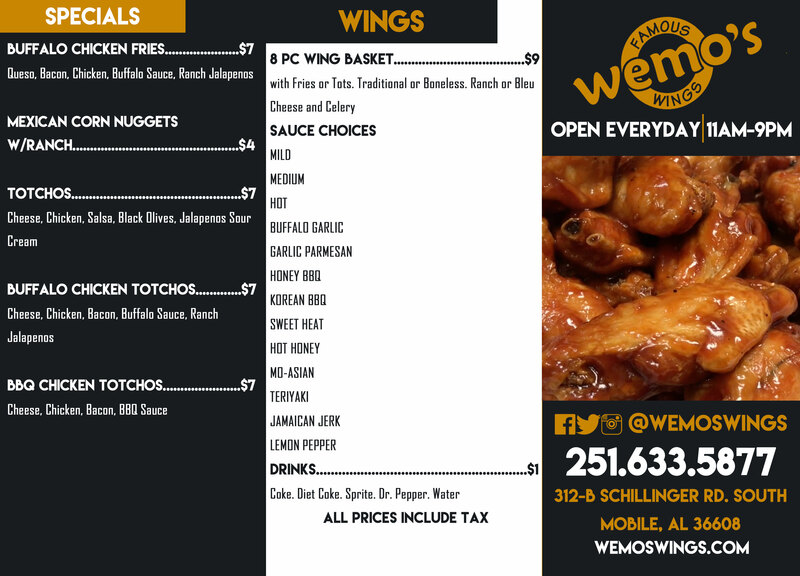 Some of the best wings in town...been going to Wemos since it opened...very reasonably priced as well...great place!!! Owners are local and are great people!!! Love wemos probably one of my favorite places to go out and eat good food !